Tina Wang is a sought out music instructor based in Vancouver, BC. Her studies have taken her from her home province British Columbia, Canada to China and the United States. Equally passionate and dedicated to music teaching, performing, accompaniment and the art of chamber music, Tina has a wide-ranging experience on the saxophone, piano, and other instruments. For over 10 years she has taught saxophone and piano, ranging from beginner to pre-college level as well as collaborating as a pianist with other instrumentalists. As a very proficient pianist before turning to the saxophone, she has had 20 years of piano studies with various instructors, and received several awards in the regional music festivals and competitions. 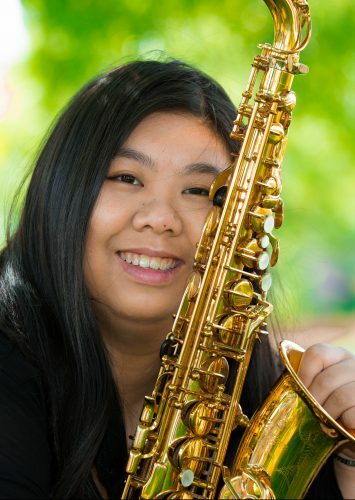 Tina is currently actively performing with the Pacific Symphonic Wind Ensemble (alto saxophonist), Douglas College Wind Band (section leader & coach), Sax Noir Saxophone Quartet, Flying Tonkatsu; an anime group ensemble (clarinet, saxophonist, pianist) and Opus Arise (keyboardist/saxophonist). Tina believes in the importance of diversity of music and can be found involved with a wide variety of ensembles and music projects, in styles ranging from classical to contemporary, jazz and symphonic metal on a variety of instruments. Tina holds a Bachelor of Music degree from the UBC School of music where she completed her saxophone studies under the tutelage of Dr Julia Nolan, a renowned Canadian and North American Saxophone artist. She also had the opportunity to broaden her saxophone studies into Asia, at the Shanghai conservatory of music with a full government funded scholarship. Tina is a member of the North American Saxophone Alliance, World Saxophone Congress, and the BC Registered Music Teachers Association. She occasionally attends national and international conferences, workshops and events. She has also had the opportunity to study with international renown saxophonists in workshops and masterclasses such as Eugene Rousseau, Timothy McAllister, Otis Murphy, Kenneth Tse, Chien-Kwan Lin and Carrie Koffman. As a passionate teacher, Tina loves working with students of all levels and ages. She loves nurturing the talents of her students. Several of her students have achieved recognition in local music festivals as well as successful auditions for the British Columbia Honour Band, the National Youth Band of Canada, Tanglewood Music Institute, and Interlochen World Youth Wind Ensemble. In Fall 2018, she was selected for recognition as a ‘teacher of distinction’ by the Royal Conservatory of Music.